Code blocks allow users to add source code fragments to their document and using the existing functionality to format and style those fragments. This can be done programmatically or via the Code dialog. 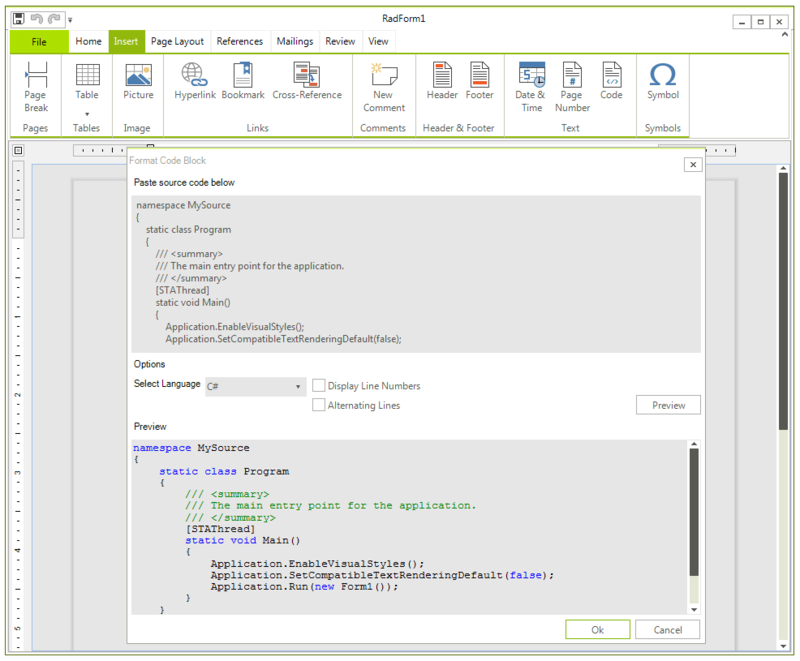 The options in the dialog allow to select the desired code language, as well as whether you wish to display line numbers and alternate the formatting of the lines. If you want to programmatically add code blocks to the document you should use the InsertCodeBlock() method of RadRichTextEditor or RadDocumentEditor. These methods accept a code fragment as a string and code settings which specify the formatting of the code block. Additionally, you can enable the display of line numbers and the alternating lines options. Dim code As String = "this.IsCodeBlock = true;" & ControlChars.Lf & "this.IsCodeBlock = false;" & ControlChars.Lf & "this.IsCodeBlock = true;"
The inner representation of the code block in the document is achieved by surrounding the content with CodeAnnotationRangeStart and CodeAnnotationRangeEnd. More about annotations you can learn in the respective help article. The contents of a code block can be selected and copied, but cannot be edited. However, existing code blocks can be modified with the code block dialog. Inside each RadDocument there is an instance of the CodeFormatter class which is used for formatting code blocks and is also an extensibility point for adding code languages. It is available through the CodeFormatter property of the RadDocument. Inside the CodeFormatter, a classification tagger is registered for each supported code language. The role of the tagger is to identify ranges in the code which should be associated with particular classification type – i.e. keywords, comments, string literals etc. The CodeFormatter class also holds information which style should be used for words identified with particular classification type. The default taggers are based on regular expressions, which come particularly handy in such scenarios. If you would like to implement a custom tagger for an already added language or a new one, you can do so by registering an instance of RegexTagger in the Code formatter. You can also implement your custom tagger by deriving from TaggerBase. With the second approach you have full control over the implementation and you may base your implementation on a mechanism different from regular expressions. Once you register a tagger for a new language, the language will be visible in the InsertCodeBlock dialog.